Want a healthy summer glow? Who woulnd't? 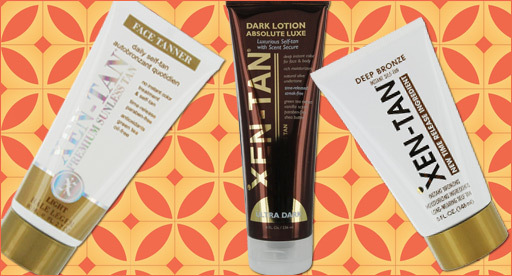 And now, more than ever, are we completely and utterly obsessed, we said it, obsessed, with Xen-Tan products. Xen-Tan self tanning solutions are easy, fun (weird, right), and long lasting. They have a lotion for everyone, from pale white skin tones to already dark tones. Choose from their luxe lotions or their weekly self tan mousse, whichever you choose, we know you'll prefer this over catching those dangerous rays in the heat of the summer. What's really great about this line? They also carry a lotion just for the face! So not to worry about clogging your pores or using the same lotion you would use on your body, this lightweight formula is also beneficial for your face! The face tanner is gentle for every day use, and is enriched with antioxidants and moisturizers for an even more healthy, summery glow. Which Xen-Tan product can't you wait to try out? !